In spite of the fact that I have more things up on my new office walls than anyone else, I still have quite a few things sitting around. I'm working on painting a poster frame red for the Fantasia poster. That will be done next week. I can only do a bit at a time because I have to spray the red on just a part of the frame owing the the acetone in the can. I do one side and call it quits. Then, I can smell patches of acetone wafting up from the basement. I was sick the one weekend this year when I could have done some spraying outside. I also have to purchase more of those 3M nailless picture hangers. I really like those. I have had a couple prints up in the house for over 5 years now and they have not fallen. I bought hangers for the posters but I need more for the actual photos I intend to hang. 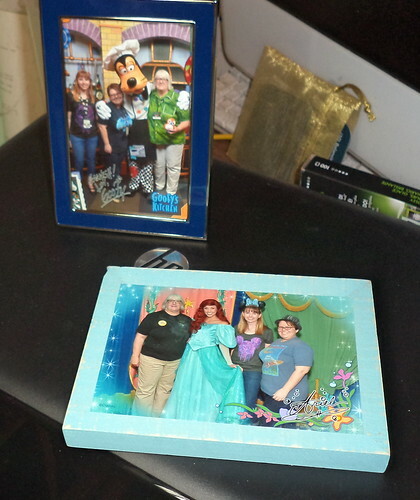 And then there was the need to get frames for some photos. Part of the adventure of having a character breakfast at Disneyland or Walt Disney World is having your photo taken with whomever the character is your breakfast is tied to. For Ashley, Liz and I, our breakfasts were with Goofy and Ariel, the Little Mermaid. Once you check in, you're shepherded to a holding area (Disney does holding areas very, very well.) where you wait for people in front of you to have their photo taken. Cast members ask, as you walk up, if there are phones or other cameras you want to use for photos. Then, as you eat, someone comes around with the photos and you can buy a package. Each one was $35 and we got enough photos for us to have our own PLUS a code we could use to purchase other sizes. In late December, I took advantage of after Christmas sales and coupons and got a bunch of frames for a variety of photos. These two are for the Disney photos. There is an issue with the aqua frame. the cardboard holding the glass into the frame is stuck. I need to bring a utility knife home from work or bring the frame to the office (which is probably the better thing since these are going in the office, but, you know, remembering) and score the back to get it out. I can tape the back into the frame since I'm not going to want to remove the photo once it's in the frame. The frame is the perfect color. These sit on the printer next to my home computer. I look at them and remember the fun. The Goofy breakfast was absolutely amazing. It was huge and there was so much great food available. The Ariel breakfast, while limited in food, had an amazing view and all these princesses came through to say hello. Ashley was thrilled and that made Liz and I happy. Yeah, they get you with the photos, but for an event like this, I'm willing to shell out a few bucks for a lovely memento.